COLUMBIA, Mo 6/10/15 (Feature) -- Before Princeton mathematician and game theory pioneer John Forbes Nash, Jr. died in an auto accident last month, he reportedly told friends and colleagues he found an equation that would improve or even "replace" Albert Einstein's famous work on gravity, the General Theory of Relativity. Einstein explained how big objects -- stars, planets, asteroids, moons -- behave in the cosmos. But he wracked his great brain for decades trying to apply General Relativity to tiny objects -- atoms, photons, and such. Nash had reportedly made a big discovery about how to resolve Einstein's dilemma. Reports about the claim -- e.g. here, here, and here -- emerged around the world, but with few details about Nash's "replacement equation". French mathematician Cedric Villani -- kind of a Johnny Depp for the math set -- provided some information, mostly from personal conversations between him and Nash, 86 when he died. This writer meanwhile checked out -- and substantiated -- the claim. Though it's a diversion for the Heart Beat to cover news beyond Columbia, we are a college town; Mizzou has one of the world's finest math departments; among Mizzou faculty, we boast some beautiful minds in physics and astronomy. And what journalist can say "no" to the unbeatable combination of John Nash -- the Nobel Prize winning subject of the Russell Crowe film "A Beautiful Mind" -- and Einstein, who revolutionized the physical universe? Like most brilliant mathematicians, Nash presumably left a pile of papers covered with equations on a desk somewhere, maybe in his home or Princeton University office. 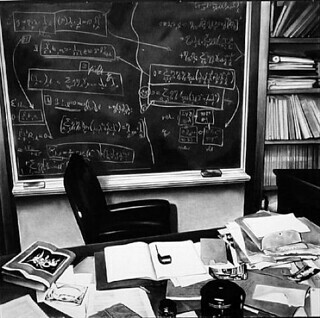 Einstein's desk at Princeton's Institute for Advanced Study -- and the formula-covered chalkboard behind it -- became famous after his death (pic below). But the crash left the lost equation in limbo. Nash and wife Alicia both died, ironically as they were returning from a ceremony for the Abel Prize -- one of the world's top mathematics awards -- Nash and fellow mathematician Louis Nirenberg received this year. It could be months or even years before anyone secures Nash's papers to search for the lost equation. Or not. Turns out Villani and company may not have to rummage through a cluttered desk after all. Nash presented the idea 12 years ago at Penn State University, as a John F. Chemerda Lecture in Science. He also left the equation -- where else -- on his website, aka The Home Page of John Forbes Nash, Jr. Simply entitled "An Interesting Equation," Nash's paper presents a new rendition of Einstein's second most famous equation (behind E = mc2). Einstein is renowned for two big ideas -- the Special and General Theories of Relativity -- and equations that go with each theory. Filled with G's and R's -- both small and capitalized -- Einstein's General Relativity equation describes gravity -- the force that keeps our feet on the ground -- as a flexible fabric made of space -- length, width, height -- and time, instead of needle and thread. To get an idea how it works, think what would happen if you rolled a bowling ball onto a trampoline. The fabric bends down, toward the heavy ball. Put a marble on the trampoline and it will roll toward the bowling ball, as though the ball was attracting it with gravity. Jump on the trampoline, and "waves" in the fabric will flop the marble around (please do take the bowling ball off first). Gravity also makes waves, an important part of Einstein's old theory and Nash's new one. Though he's not the engaging writer Einstein was, Nash walks us through his new equation cogently, carefully, and wittily. His idea, he notes, has all the right stuff to command scientific attention. Right stuff #1: It's based on an important mathematical recipe called a "Lagrangian," named for Italian mathematician Joseph-Louis Lagrange, that physicists routinely use to construct new scientific laws. If you look at the Lagrangian Nash used, you'll see those R's and G's. Nash also pays close attention to history, noting how his work builds on the shoulders of other giants like Gregorio Ricci, an Italian mathematician and physicist Hidekei Yukawa, Japan's first Nobel laureate. Nash then lets us know he's onto something. Other scientists had "never focused effectively" on certain aspects of these mathematical recipes, he notes. Taking "a quite different route," his new equation "seems to provide for or enable a wider variety of gravitational waves." Choice is a good thing, especially in science. The gravitational waves Einstein described only kept cosmic objects in check. Could Nash's "wider variety" also guide how atoms and sub-atomic particles behave? Cedric Villani and other experts will doubtless check it out. If Nash was right, it could be huge. The lost equation -- and the lecture about it -- is interesting and entertaining in other ways, too. Nash gives equal credit to the mathematician David Hilbert, who discovered the same gravity equations at the same time Einstein did -- 1915. "These ideas were entirely equivalent but were derived differently by Hilbert and Einstein," Nash writes. Giving credit where it's due isn't as common as it should be, especially in the academy. So good on John Forbes Nash for staying classy. Finally of interest to rival physicists gossiping at the latest Relativity and Quantum Gravity conference (there are such things), Nash takes a shot at venerable quantum theory, kind of a longstanding competitor to relativity theory -- and that thing Einstein wracked his brains over, trying to get the two to play nicely together. "To me, it seems like 'quantum theory' is in a sense like a traditional herbal medicine used by 'witch doctors'," Nash quips. "We don’t REALLY understand what is happening, what the ultimate truth really is, but we have a 'cook book' of procedures and rituals that can be used to obtain useful and practical calculations, independent of fundamental truth." Meanwhile, the world will wait to see if Nash tweaked his 2003 recipe, maybe even perfected it enough to improve on Einstein. Regardless, it's clear his beautiful mind was still hard at work, trying to find beauty in some pretty ugly math. [A dissertation away from a doctorate in physics, Martin wrote his masters thesis at the University of Washington on little-known aspects of Einsteins General Theory of Relativity. As a journalist, he broke stories about the British Prime Minister "muzzling" his Chief Science Officer over climate change; missing evolutionary biologist Margie Profet that led to a reunion with her family; and the discovery of the cancer type that claimed the life of Steve Jobs].